Ropes Challenge Course is a wonderful way to actively spend spare time. It’s originated in France. It consists of a series of cables, ropes, and obstacles strung between trees or poles that challenge participants and increase the secretion of adrenalin. It is a great fun for young as well as for adults. 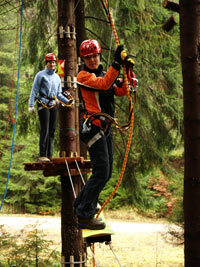 Ropes Challenge Course of Krynica is situated in the forest at the bottom of Jaworzyna Krynicka Mountain, by the road to the lower station of ski lifts no. II and IV(to Izwór). Adjacent to the course, there is a main, red tourist trail leading up to Jaworyzna. Ropes course and its surroundings is a perfect place for integration, occasional meetings and events. We will cooperate with you in order to meet all your individual needs and demands. We provide all-embracing, professional service and guarantee you will have wonderful time. 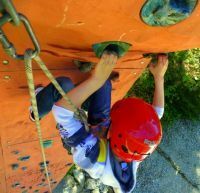 Ropes Challenge Course of Krynica consists of 7 routes available: low - for children, average - for everybody, high - for daredevils and ropeslide. Extreme Route - for daredevils. Consits of 19 obstacles, in some places up to 15 m. height. Low Route – was prepared especially for the youngest and those with acrophobia. Obstacles on this route are mounted 1-2m above the ground. Some of them are: climbing wall, breakwater, slide on a plate and many others. Average Route – was prepared especially for older children and adults. Obstacles are about 4m high. Its level of difficulty is not that high, it was designed for those who start their adventure with the ropes course. To finish this track you have to among others jump into spider’s web, go down on snowboard, go through tearing ropes. High Route – designed for those who are not afraid of height. Obstacles on this route are mounted 8-10m above the ground. It is a route of high difficulty because of not only height but also the kind of obstacles and ski & sledge slide between trees that is unique in Poland. Ropeslide Route – it consists mainly of zip-lines (the longest is 120m long) and there are 3 additional obstacles. The total length of slides is 260m. Ropes Challenge Course of Krynica was built according to the safety rules based on the requirements of the UIAA (the International Mountaineering and Climbing Federation). Belay system used in this course is consistent with the safety rules and principles of climbing (supervised by cave climbing inspector of PZA and AWF in Cracow). How to reach our course?